Not long ago, I said that an announcement was forthcoming. The announcement was related to an ongoing effort to overcome cycling obstacles. It was noted that rain and darkness obstacles have been minimized and that investments made in these areas have proven themselves many times over. Until recently, travel remained a HUGE obstacle. Hopefully, this latest investment will prove to be as successful as the others. The "Tikit, Model T" from Bike Friday arrived while I was in Phoenix. Although it did not arrive in time for that trip, other opportunities will come. After returning home, it was unpacked, unfolded, and pedaled around the living room within minutes. The bike is designed to allow it to be folded and carried or rolled indoors, on other modes of transportation, in an office, in a trunk, etc. Since Bike Friday was had special pricing during January, it was a great value. So I also purchased the optional suitcase and packing materials so that I can partially disassemble, pack it, and check it as baggage during air travel. The clever design allows for a quick and simple pack/unpack process. There was no plan to ride this today. The plan was to ride much farther yesterday...on bigger wheels. Since it remained in the 30's yesterday and the forecast was for temps in the mid-40's today, I rescheduled the long ride for today. Contrary to the forecast, it remained in the 20's all morning. When it is that cold, I generally don't need to ride far. A short shake-down cruise on the "clown bike" (as affectionately named by Janet) seemed perfect. 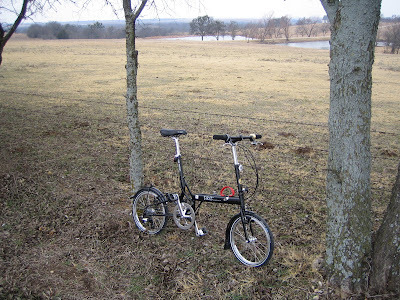 With its small wheels, it is not ideal for long distance cruising. 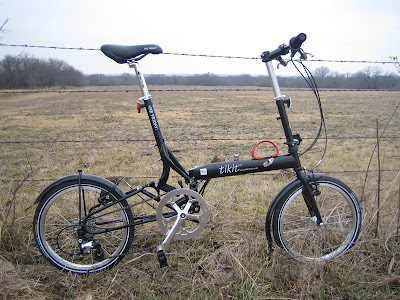 However, it rides surprisingly well and should be just right for those shorter adventures while traveling. A clown bike obstacle climber, as it were.